Amber is fossilized tree resin, which has been appreciated for its color and natural beauty since Neolithic times. Much valued from antiquity to the present as a gemstone, amber is made into a variety of decorative objects. 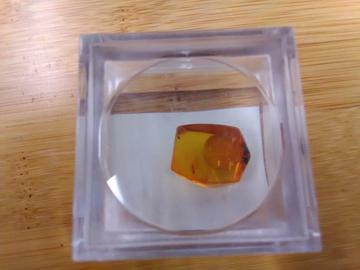 Amber is used in jewelry. It has also been used as a healing agent in folk medicine. Amber is sticky, like honey or glue. The insects land on tree sap either intentionally or by accident, and can't exert enough force to remove themselves from it. The tree sap continues to flow and coats the insect. The sap hardens into amber, preserving the insect forever.